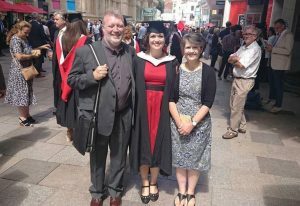 Three weeks ago today I graduated from my undergraduate degree (BSc Psychology with Professional Placement) at Cardiff University, bringing four years of hard work to an official close. It’s safe to say that it has both been very challenging at times (contrary to what some people will tell you, psychology is no walk in the park!) and I feel my degree has provided me with a solid foundation on which to build with postgraduate study and helped me become a more resilient person. — Hat-throwing, Cardiff City Hall, July 2018. Now that I have my undergraduate degree, I plan to continue my studies at Cardiff University. I have a funded place to do an integrated Masters-and-PhD programme in the School of Psychology, starting in September. The first year involves doing a Masters in Research Methods in the School of Social Sciences, followed by three years of PhD in the School of Psychology. My PhD research will involve evaluating the effectiveness of attachment-informed interventions for adopted children, and I feel really excited to have the opportunity to do research that I think is both really interesting and immensely important. I’m treating the PhD as an opportunity to learn and develop my research skills, and I’m currently undecided on where I want to take my career following the PhD (although given the Masters and PhD will take at least four years, I have plenty of time to figure that out). One option is to apply for clinical training (to enable me to become a Chartered Clinical Psychologist), as Clinical Psychology was what I originally wanted to do when I decided to study psychology for my undergraduate degree. Doing a PhD in a clinically-relevant area allows me to keep this option open, as well as greatly develop my research skills and learn about something that fascinates me. My time at Cardiff University has been invaluable, and I’m looking forward to the next steps of my journey as a postgraduate student here. 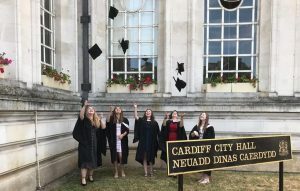 Good luck to everyone receiving results next week and don’t forget that if your results aren’t as you expected, Cardiff University has opportunities available through Clearing. Find out what courses are available for entry in September 2018 by visiting us here or calling us on 0333 241 2800 once you’ve received your results! — With my parents outside St David’s Hall, Cardiff, July 2018.